Our exclusive collection of Binola Jute Bag is perfect for packaging. 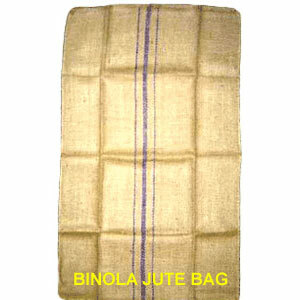 We procure the excellent grade of jute threads and fiber to design these bags. These are widely used for carrying a number of items in a safe manner. In addition, the Binola Jute Bag have a perfect finish, colors, sizes or designs that perfectly match with your requirements. Other description Mouth hemmed, overhead dry sewn, 3 blue stripes in the middle, natural jute color, calendared.